A trio of clever custom built in kitchen cabinet organizers. Tired of tangled cords and cell phones taking up valuable counter space? 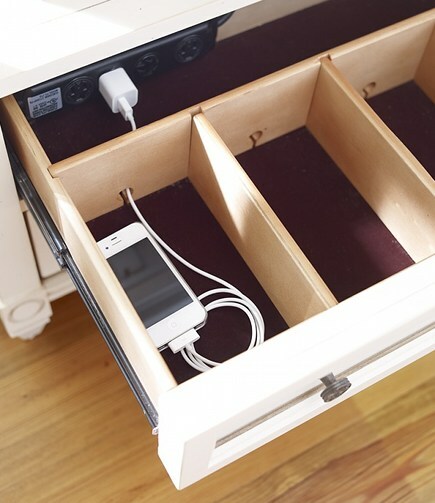 Keep your high tech toys handy, but out of sight, while charging in a custom drawer complete with electrical outlets. Wooden dividers keep items separated and the drawer lining helps protect. An extra section could keep the Mr.’s car keys and wallet overnight. A little ingenuity goes a long way to help control the recycling. Three circular cut-outs, fitted with tubing, guide recyclable kitchen bottles, jars and containers into bins. 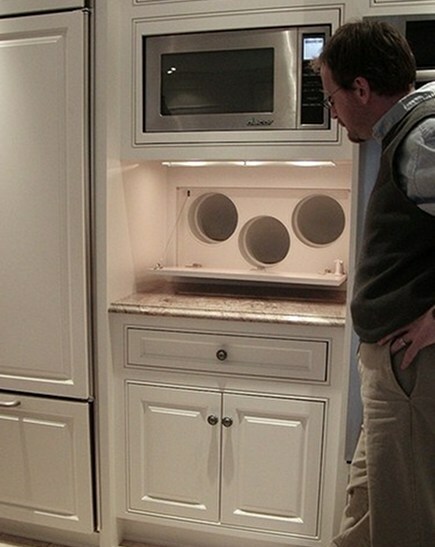 The cabinet could be placed adjacent to the garage or in a walk-in pantry for easy access. While the drop-down door renders the counter useless, a single chute would work for our household – glass is not collected in our area and items are not required to be divided. Smart ideas can always be adjusted to suit your needs. This trash bag storage drawer is going in my “next house” file. 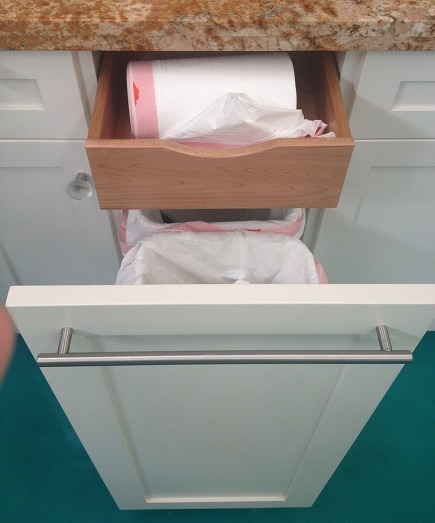 Many pull-out trash can cabinets are under a drawer, often used for dish towel storage since the sink is close by. I think this set up could also be practical for a hidden paper towel holder as well.